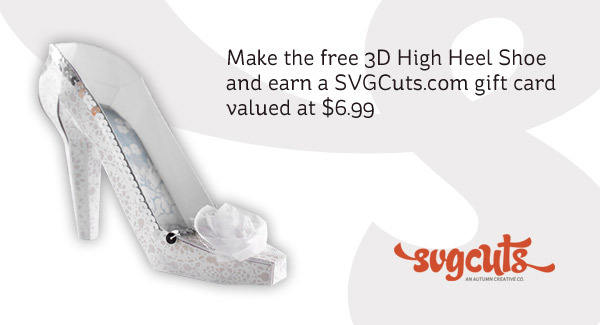 SVG Cuts is doing another $6.99 gift card giveaway! This time its a 3D high heel shoe. All you have to do is download this free 3D high heel shoe, make it and submit your photo! Hurry offer expires 8/12/2013. They are also giving away BONUS $25.00 gift cards... click HERE for all the details! I've had this file in my collection for a while but haven't had an excuse to make it so today was the day! LOVE them! They make the perfect pair of heels... Solemates, lol! The possibilities are endless. Change the papers and you have a completely different look! I think these would be great little treats for brides, bridesmaids, shoe addicts or for a girlfriends' birthday! The bows from the shoes come from HERE. The patterned paper from Recollections. Here they are again from a different angle! Aren't they hot?! Hope you like my take on the high heel shoe. Thanks so much to SVG Cuts for this awesome giveaway!